Also, all credits for the graphics go to the original creator. To be honst with you guys, I've never been into Pokemon, never watched the show nor played any of the games until Pokemon GO came around. I was extremely hyped as I waited for it to be out in my country and, if you've checked my twitter, you know I'm OBSESSeD with the game, as is almost anyone right now. if you've somehow not heard of it yet, it's basically an augmented reality Pokemon game where you actually leave the house and walk around to catch Pokemon. Amazing, right? in the first 3 days after downloading it onto my phone I walked like +30km so there's that. 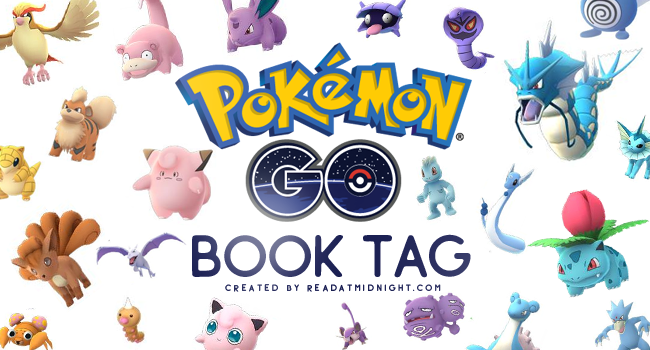 Anyway, when I saw that Aentee aka Reading at Midnight created a book tag for Pokemon Go, I immediately knew I had to check it out and do it, though I've not bee tagged by anyone. So, thank you to Aentee for creating the tag and let's dive right in, shall we? I chose Bulbasaur just so you know. No idea why it just kind of happened. It wasn't until two days later that I found out there is a way to get Pikachu as starter but it was too late already. I seen a Squirtle on my nearby list but not actually seen it, and Charmander, no sign of him. I'm probably the odd one out by saying The Legend of the Ice People by Margit Sandemo because no one ever knows what I'm on about when I mention it. I found it at my grandma's house and randomly read the first 12 tomes across two weeks because I just got so into it. Maybe I should read it again some time, see what it was that made me so addicted to it. I want a Pikachu but wow they are so hard to come by. Props to those who caught one, so jealous really. Of course I'll be totally original here and say Harry Potter, because Harry Potter. So far I've caught and seen so many Zubats in my area it's crazy. Anyone else? Then again, the most common ones around me are Pidgeys and Rattatas, but Zubats are closely behind those two. Though I've not come across the evolved version just yet. When it comes to a book I lost interest in because it's everywhere I actually have two answers, both probably equally unpopular. Number 1 is Red Queen by Victoria Aveyard. This book is really hyped, as are the sequels, but I've just really lost any interest I had at first to read it. I've heard a lot of mixed things about it, my bestie told me I probably won't like it, so this one is very high on my 'probs not gonna read it' list. A close second is the Throne of Glass series by Sarah J. Maas. I've read Throne of Glass and I fairly enjoyed it, but then I started the sequel and lost my interest. Also, let's face it, this series is also everywhere and everyone talk about it and either really loves it or is indifferent toward it. From what I heard where the series is going (Yes, I've actually watched Polandbananasbooks' reviews for all the books...) I'm even less interested in it. I guess high fantasy is just really not my cup of tea. To be honest, I've pondered bout this question for three days now and the only book that came to my mind was Anna and the French Kiss by Stephanie Perkins. Don't get me wrong, I LOVED Anna but let's face it, it had a lot of tropes and things we've already seen done numerous times in YA, but, still a cute read tho. I've not seen a Snorlax yet either, though that's not quite true since I saw someone have it at a Gym, but I've never seen it in my surroundings being actually catchable. I'm probably the last person in the book community to read this one even though I even got it as audiobook, but yes, I've still not read Lady Midnight by Cassandra Clare. I've loved The Infernal Devices, I enjoyed The Mortal Instruments, so I have no idea why I've not made my way through Lady Midnight just yet. I mean, I've started it but only got about 10% in before I stopped to read a book I had for review so...But I hope I'll get around to reading this very soon. But like that size tho, holy. For some reason Gengars remind me of danisnotonfire and AmazingPhil solely because they have plushy version of it and it was in one of their videos, I think. I don't even know. But I'd really like to catch one. The last book that has kept me up at night because I simply had to know how the story continues and how it'll end was Life After Juliet by Shannon Lee Alexander. This was an amazing read and worth all the sleeping hours I've sacrificed to read it deep into the night. You should check it out. So far I've only encountered and captured their smaller versions (bravo me for not remembering what they are called and being too lazy to look it up...fake fan) in both the male and female version. I have so many OTPs BUT I have three main ones belonging to my favorite standalone, trilogy and series. I can't decide on one single favorite so each of these three has their own one. Starting with my fave standalone, The Sea of Tranquility by Katja Millay, which has my OTP Nastya and Josh. That book is amazing and these two are perfect and I just love them so much. Next up my favorite trilogy is the one I can all of you can name because let's face it I've talked about it at least a thousand times on this blog already - The Mara Dyer Trilogy by Michelle Hodkin. Mara Dyer and Noah Shaw are perfection, fight me. I love Noah so much I even named my laptop after him. That's dedication right here. And my favorite series (I see people coming after me already for not saying Harry Potter) is Vampire Academy because it's awesome and it has Rose and Dimitri. Dimitri is literally goals right there, just saying. BONUS: Alec and Magnus from The Mortal Instruments series by Cassandra Clare. They are my favorite pairing from all her books, because like how could they not be?! Malec are a-maze-ing! First of all, I love Ponyta and Rapidash, they are legit my fave Pokemon of them all, just saying. I'm gonna go with Illuminae by Jay Kristoff and Amie Kaufman. This is an outstanding read with a fast pace, thrills and scary moments, and a incredibly unique way of telling the story in terms of formatting. So impossibly cool! You should read it if you haven't yet. Eevee is so cute and her evolved versions are really cool and I'd totally love to get all of them, but until now I've only seen a total of three Eevees so I guess I'll have to wrap myself in patience. I'm no not going to surprise anyone with my answer because of course I could never get enough of the Mara Dyer trilogy by Michelle Hodkin, so the fact that there will be a spin-off series makes my heart perform the biggest happy dance ever. Can't wait to read it all! When I first heard about Vampire Academy by Richelle Mead thanks to th movie trailer I was underwhelmed BUT then I actually watched the movie (and was one of the very few people who actually really like it) and simply had to read it. To my surprise the series quickly became my favorite series of all so theres that. For this one I'm going to go with the Shadow and Bone trilogy by Leigh Bardugo. The book world is crazy about these books and the Six of Crows duology (?) so I cannot wait to finally get to reading it and finding out what all the hype is about. The only one that comes to my mind is that amazing edition of Harry Potter in the four house versions because I'd totally want the Slytherin one, because I'm obviously one. Too bad that they are so crazy expensive. Heres a tiny rant: All the eggs I've so far hatched were all complete crap. Like how even? Each one I hatched was a Pokemon I already had before, and like there was like a Rattata in a 5km one. WHY? Still waiting for my Ponyta, seriously. A book y a debut author I look forward to is The Weight of Zero by Karen Fortunati even though I've already read it, but I can't wait for others to read it and hopefully love it just as much as I did. It's an absolutely phenomenal book that means the world to me. So much love. Michelle Hodkin (selling my soul to her because Mara Dyer is everything), Sebastian Fitzek (he's the only German author I enjoy reading and his psychological thrillers are just absolutely chilling and goals), Karen Fortunati (a-ma-zing and just such a nice person, I like Karen a lot) and Mia Siegert (brilliant author, amazing words, such an incredibly nice person that has so many helpful things to say and like her current WIP is the best thing ever and I'm so excited that I got to read part of it). Even though the servers were down in my area a few times, I've actually never seen this screen--lucky me--but as fellow players I know you've most likely encountered it and you know what horrible sight it is, especially when you just REALLY want to play. Though I've spent way to much time with the loading screen, like seriously, we're like frenemies now and I am slowly getting a bit sick of seeing it so much. I am DYING as I'm waiting for Gemina by Jay Kristoff and Amie Kaufman, the sequel to Illuminae. I LOVED Illuminae last year (here's my review), and I might be getting an ARC of Gemina so I'm beyond excited. I've heard really good things so far so that doesn't help. Must have it. Must read it. NOW. And that's it for the Pokemon GO Book Tag. If you want to do this tag, feel yourself tagged by me right now, and if not, I hope you enjoyed reading my answers. Below in the comments, tell me if you play the game and, if so, which team are you?